20-something-year-old sisters Vishala and Kamakshi Khurana have recently set up the Sound Space, a place where they cure everything from physical and mental stress to schizophrenia with a soothing mix of classical music, instruments, movement, chanting, yoga, tarot, and chakra alignment. After a recent set of workshops in Bombay, they tell us about the genesis of the idea, the techniques used, and what the future holds for them. 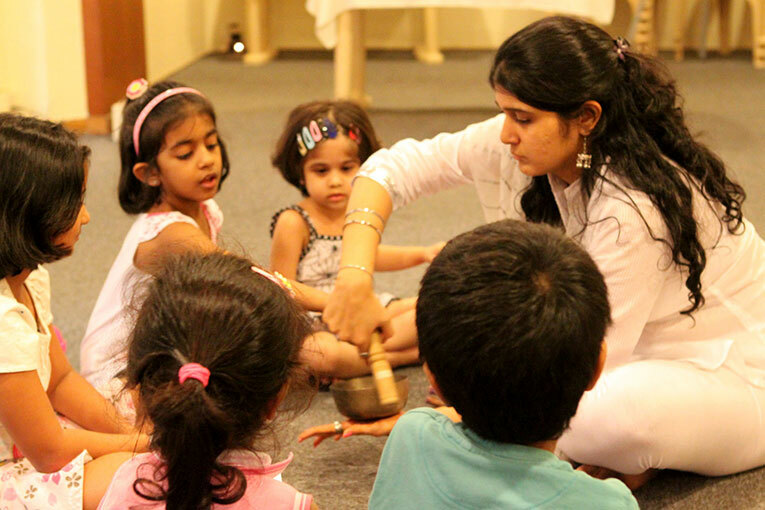 Children at a music appreciation and awareness workshop conducted by the Sound Space. Tell us a little bit about the Sound Space concept. Vishala: Our dad has been involved with classical music as a bhajan and ghazals singer for a very long time. Somewhere along the way he realised that he wanted to use his talents in a different way; after years as a singer, he realised that his journey was more spiritually guided. Gradually, we joined him too. Somehow, Kamakshi knew exactly what she wanted from life at age five. So we both finished our graduation in Hindustani Classical music, majored in psychology, and then began to see how we could make this work. Age five is quite early. What are your parents like? Kamakshi: Our parents are better than any psychologists, I tell them everything. More than my mum, I confide in my father. They’re very open as parents. And music has always been there; besides doing the degree, my basic music education has been at home with my father. My father was always a renowned singer—I remember him doing concerts and shows and traveling abroad, until one day he decided that he didn’t want to do that anymore. I found that I’ve learnt a lot from him and gained a lot of my strength there; in fact, my first idea that this is what I should do stemmed from watching his career path. Could you describe the genesis of the idea? Kamakshi: I always knew I wanted to do something in relation with sound and psychology, but I didn’t know what exactly. And while I was studying both music and psychology, I saw the connection between the two. I saw how music actually helped adults, and children too. Through college, I noticed several such incidents and did a lot of research; through Hindustani Classical too, I learnt several related things. At this time, some eight years ago, my father had started studying meditation technique in greater detail. As teenagers, we obviously didn’t want to get into meditation; it seemed too heavy for us. But then I noticed that what they were doing was something very unique, more than meditation, it was using sound—that’s when I saw the potential. Their work was very different; it had to do with simple things like breathing. I realised that this could be the thing and we could introduce a whole fun angle to it using every aspect of music. When I started thinking about how to make this work, Vishala thought it was an excellent idea, so she joined us too. How do you apply these concepts with the Sound Space? Kamakshi: We have various workshops and sessions for different age groups, to deal with different things. All our workshops use sound in a different way. For example, in the chakra alignment workshop, we chant the Bhij mantra. Additionally, a lot of people come to my father for chakra alignment where all he chants the Bhij mantra after we have counseled them and put our finger on the problem. The idea behind chakra alignment is that the body is in harmony when the chakras, i.e., the energy centers in the body, are in alignment. An imbalance in the chakras always manifests as a physical or emotional problem. The problems that we deal with most are stress, depression, leukemia, brain degeneration, and spondilitis. We also use colour therapy, movement therapy, and tarot. The recent weekend workshops [in Bombay] were an introductory course where we merely initiate people to give them an idea of what it’s about. How does dance movement therapy work? Vishala: The idea is to help people become comfortable with their own bodies, with moving about and being at ease. For example, if I told a random group of people to spontaneously get up and be water, very few people would be comfortable enough with their bodies to get up and do that. At the end of a session, you should be able to move like water if I tell you to move like water. Movement helps to attain peace of mind, be at peace with your feelings, and give proper relevance to emotions, besides solving some deep-seated problems. What was your personal journey towards this? Kamakshi: When I was in school and college, a lot of my friends thought I was a weirdo. I was from a convent school where studies are everything, and I was pathetic at that. I got labeled as the ‘creative’ type and my teachers thought nothing good would ever come of this. It was through time and experience that I began to see the interlinking of music and other things. For example, when I was in school, my parents begged me to just study the minimum amount of math required to pass, but when I was in senior college, learning Hindustani classical helped me realise that beat, rhythm, and the tabla are really just mathematical concepts. After learning music, stats became a breeze for me. Soon I realised that music puts things in a relatable format—my research began here. I started teaching when I was 16, in that time I worked at a lot of places, with a lot of institutions; I did a lot of training, attended teacher’s trainings and I learnt a lot too. I started with kids first. Over this period, I learnt a lot about sound and its ability to relax and heal people. This has been constant research for me. Vishala: There was a time when I wanted to be a dog psychologist. Then as I got into college, my mother convinced me to do the first Indian classical music degree. After that I was hooked—I completed the second degree too and began teaching. What followed next was the natural progression of things. How did you realise that this was what you wanted to do? Kamakshi: It was in my nature, I just always knew. My parents are very strange—they’re not religious, patriotic, or cultural; they’re worldly people. But I was always very patriotic; I knew that I wanted to do something revolutionary for the country. In college, I put all my energy into youth politics, until I realised that I should be using my energies for something better, which is when I realised that sound had the potential. I’m the kind of person who’s very open—hundreds of people come and confide in me—but yet there are only about two people who I would confide in. I think that one has to keep to oneself in this kind of work. 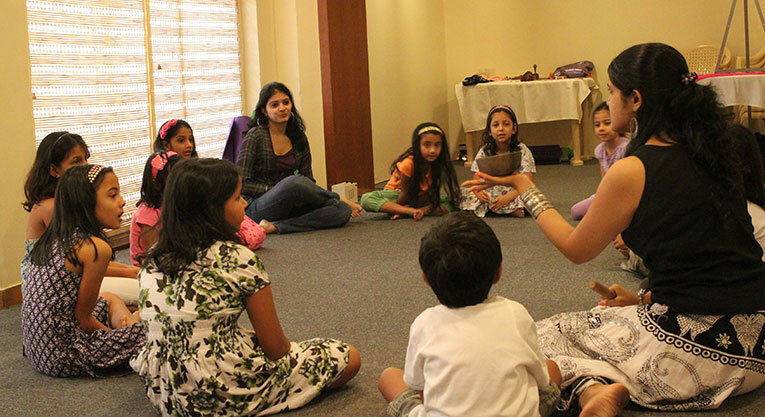 The sisters enlighten children at a music appreciation and awareness workshop. Kamakshi: We’re both trained as Hindustani classical singers. In learning Hindustani, we’ve gotten acquainted with a bit of everything (most instruments), though our prime focus is the voice. We use different instruments in the workshops based on different raags and the requirement of different individuals. For example, we might use the raga Durga, which is the energising raga to cure a depressed person; for this the ektara is used to create that energetic vibe. Vishala: For chakra alignment we use the tanpura to give the sur, which is the note on which you can chant, because pitching right is one of the most important things. The tanpura also has a very calming effect. We also use the Buddhist bowl, which is quite cleansing. How do you work with people who can’t pitch correctly? Vishala: Gradually, over time, we bring them to the correct pitch too. In group sessions, we’re prepared for everyone not pitching dead-on, so we try to work with them to gradually bring them to the correct pitch. What international research have you done? Kamakshi: We studied the Fessmann family’s techniques in Germany. They do a lot of music therapy and have a hospital too. In fact, the decision to create the Sound Space came soon after meeting with them. We could connect with them because although our base is Indian classical, we are just using sound, basically. The only way we’re really Indian is because of the Bhij mantras that are used—beyond that there are thousands of ragas with new ones being created everyday; we only use a few. What research have you conducted in India? Vishala: Our research is majorly through personal experience; in India there was no other research to fall back on. We ourselves have been working with people for about a year. We do a lot of work, we keep working on it. Kamakshi: And then there’s the ‘Resonance’ series: created, researched, and documented by my father. This was the fundamental research that we began our work on. Besides this, we’ve taken several related international courses over the years. Are there any side-effects to this sort of alternative treatment? Vishala: To be very honest, sometimes when an individual is very open to the method, their body may react with a slight fever. This happened in the case of one patient who is nearly comatose, so the fever was actually a good sign that the treatment had begun to take effect; at least we know he’s reacting. What is it like working so closely with your own family on a daily basis? Vishala: At home, we all listen to our own music; in our house, there’s always pop, jazz, rock, classical, a good mix of stuff playing. Even though we work so closely, we try and give each other the space we need. What is the relevance of the Sound Space in today’s day and age? Kamakshi: We’re launching this right know because we’ve been gathering information and research for a while and we feel we are finally equipped to make a difference, or we know enough to try, at least. Vishala: Right now, people need something they can trust and believe in. There are even a lot of young people who get involved because they see us here and realise that if we’re involved, there must be something good going on. What does the future hold for the Sound Space? Kamakshi: We plan to set up a centre or an institute, but that maybe much later. For now, our closest goal is to set up retreats, so that people can go away for sound therapy. In time, we could open a lot of centres—that’s on the cards. And definitely summer camps. We have regular sessions set up first, basic things and workshops, then the retreats, and eventually the centers. For more information, visit the official Sound Space web site. When her head is not in the clouds, Tracy likes listening to people talk, playing with puppies, and baking up a storm. She has been known to laugh repeatedly at her own jokes.